Bunches rose from a small company in Mansfield started in 1989 to become one of the nation’s favourite flower sellers. Sending gorgeous arrangements up and down the country with the power of post, Bunches has made and sent over 6 million bouquets. With every occasion and style catered for, if there are flowers you can’t find on Bunches, they aren’t worth having! Its range even covers hampers and balloons for something a little bit different and even house plants for those who want a longer term solution to a floral deficit. Shop regularly and you could rack up coveted Posy Points that could go towards your next purchase. With quality and reliability as watchwords, and a great customer service rating to match, Bunches will quickly become your go-to flower website. How do I use my Bunches discount code? You’ll earn Posy Points on each order that you use to get money off future purchases! Can I include a message with my Bunches flowers? Does Bunches flowers deliver to hospitals? Yes, but make sure you check with the hospital whether or not they allow fresh flowers on their wards. How can I pay for Bunches flowers? Bunches flowers can be paid for with most credit and debit cards from around the world, including American Express. Paypal is also accepted. Delivery is free for all flowers! Flower and balloon gifts take 1 - 2 working days. Email or phone Bunches if you wish to cancel an order as this cannot be done through the website. Monthly flower gifts can be cancelled 5 working days prior to send. Whatever the occasion, there’s nothing like a beautiful bunch of flowers to show someone you care. Whether it’s a birthday, wedding or anniversary, you can bring the joys of nature into someone’s home with a beautiful hand-tied bouquet. A Bunches discount code from vouchercloud could save you money on your next order, so head over now to take advantage of some great deals. Give the gift of flowers and make someone’s day! Bunches’ website is incredibly easy to use, whether you’re a dedicated horticulturalist or a novice in the flower world. You can search flowers by occasion, to nail the tone of a ‘Congratulations’ or even a ‘Get Well Soon’ present. If you know your recipient fancies carnations, freesias or roses, you can shop by flower type. Equally, if you’re on a budget you can narrow your search by price to ensure you get maximum value. 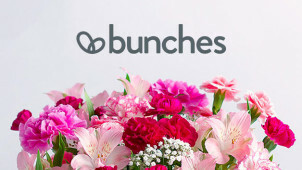 Bunches makes ordering your flowers easy! We love a hand-tied bouquet at vouchercloud, and the arrangements at Bunches are sure to bring a smile to the face of any recipient. A Bunches voucher code could cut the cost of your next order, so you can bring a bit of joy to the world for less! With bouquets for any season or occasion arranged by the Bunches experts, you could get someone an elegant combination of delphiniums, lillies, carnations and more for less than you’d expect.